In November 2015 we completed the Environmental Land Protection & Preservation report for York Region. 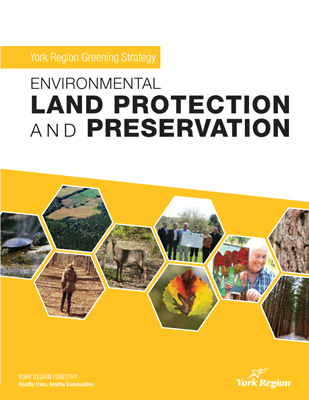 The report was developed to communicate to York Regional Council and conservation partners the intent and mechanisms in place for the delivery of the Region’s Environmental Land Protection and Preservation Program. The Region has demonstrated innovation with forward-thinking conservation initiatives and sustainability planning for environmental land protection and preservation of its natural heritage and biodiversity. As the Region experiences rapid population growth in the next decade, the need to maintain a healthy, sustainable community and environment continues to be top of mind in planning and policy development. Commitment to this is demonstrated through the Region’s visioning and strategic planning documents. Protection through planning and policy will continue to be a successful tool for the protection of environmental lands. Since 2001, the Region has contributed to the protection of over 1,100 hectares of environmental lands in partnership with municipalities, land trusts and conservation partners. Success continues in York Region due to commitment from residents and all partners to communicate, share resources, and achieve results. The Regional Municipality of York stretches north from Toronto to Lake Simcoe covering 1,762 square kilometres (176,200 hectares) of land. York Region has grown from a series of small rural villages into a mosaic of communities as diverse as its people. The Region is home to over one million residents in nine local municipalities including the Towns of Aurora, East Gwillimbury, Georgina, Newmarket, Richmond Hill, Whitchurch-Stouffville, King Township, and the Cities of Markham and Vaughan. Its rich natural heritage – the shores of Lake Simcoe, major valleys, extensive forests and wetlands, the productive soils of the Holland Marsh and the rolling hills of the Oak Ridges Moraine – continue to attract people, sustaining and expanding the Region’s health and economy. As the Region experiences rapid population growth in the next decade, the need to maintain a healthy, sustainable community and environment will be kept at the forefront of planning and policy development.